Most birders who have had the opportunity to travel will know about High Island, a small township along the gulf coast that is among the most famous of birding locations in the country. This relatively small plot of land, along with other spots within a few minutes drive, can boast bird lists higher than many states, if not whole geographic regions of the country. What surprised me during our visit last May was the diversity in habitat. High Island is mostly famous for its potential for massive fallout during spring migration – migrating songbirds either traveling up the coast or flying directly over the gulf will stop here for a drink of fresh water and to fill up on grub before continuing north to nesting grounds. We realized we were going to miss most of the migration at the end of May, but still wanted to pay a visit. 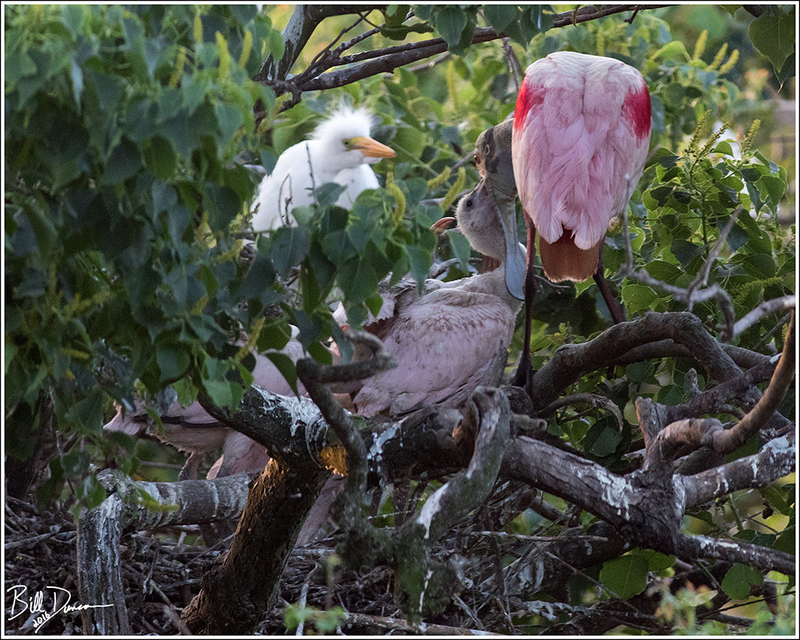 The place is so popular that there is bleacher seating around key ponds to allow for visitors to watch as birds by the hundreds land for a drink and forage through the live oaks. 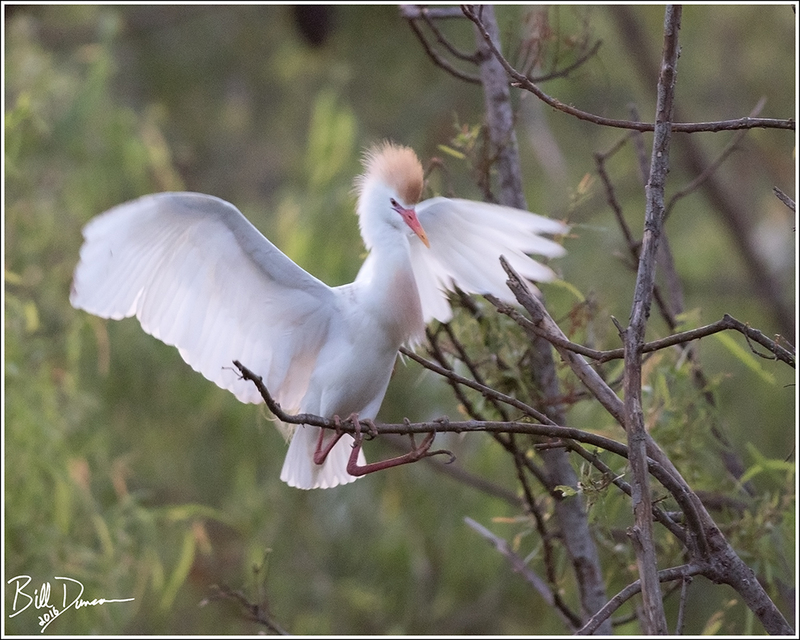 The numbers and diversity of songbirds across the Houston/Galveston coastal areas we visited were even sparser than we anticipated, but on arriving pre-dawn at the rookery we were quite surprised. Every bit of vegetation on this relatively small island was being used by wading birds. 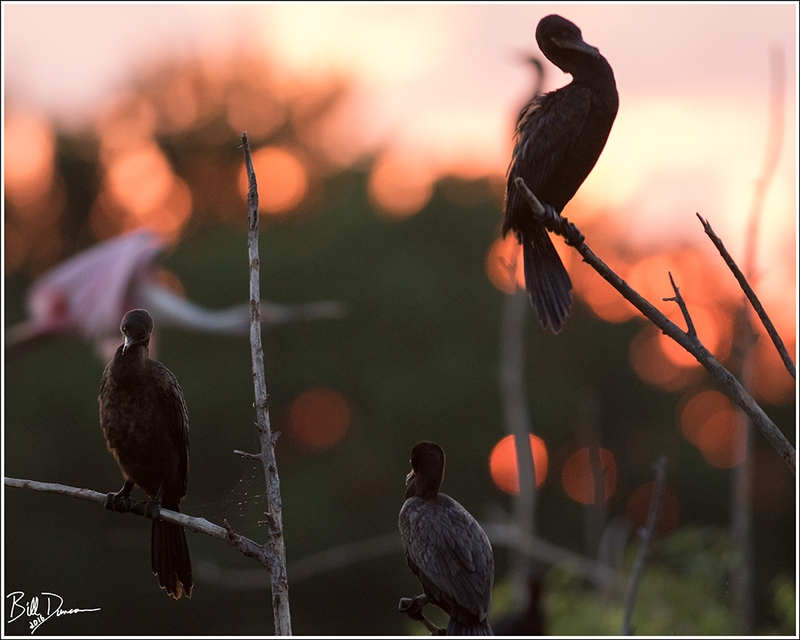 We were in awe by the numbers of Neotropical Cormorants and Roseate Spoonbills that filled the branches as well as the skies. Lighting was quite challenging – what little light available at this time of the morning was often coming from behind the subject. Evening may have been better photographically but we had lots of ground to cover. 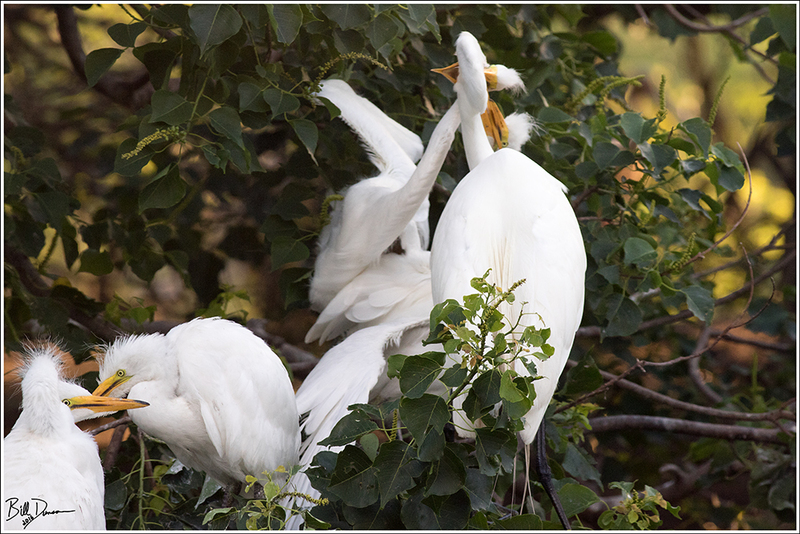 One of the sights that had me the most excited was a nesting Great-Egret. These are birds that are routinely found during the warmer months in Missouri, but finding one feeding chicks was a real treat. 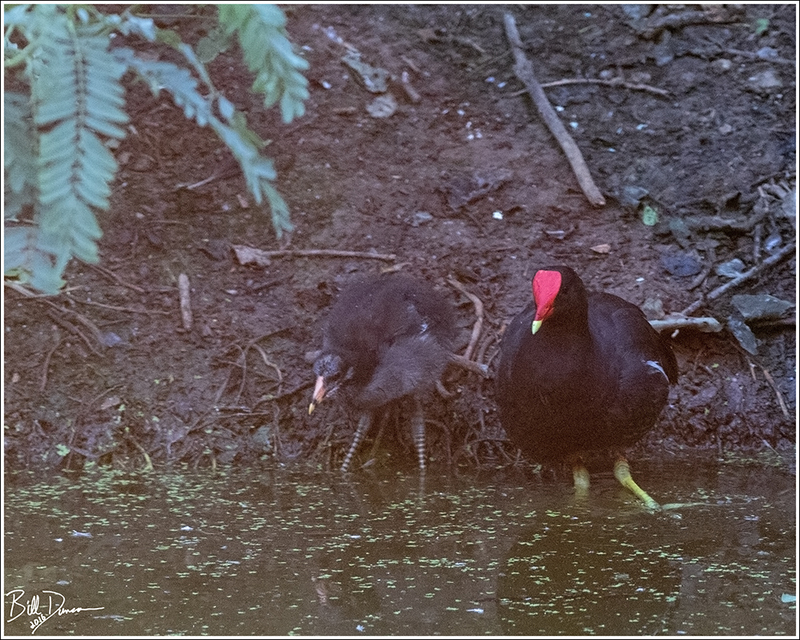 Early in the dawn hours we were treated a Common Gallinule (Moorhead) hen bringing her chicks down to the water for a drink. Prehistoric looking Spoonbills would sometimes fly right overhead. I hope to visit High Island some spring during a nice fallout period one day, but I will be just as excited to watch and photograph at the rookery once more. 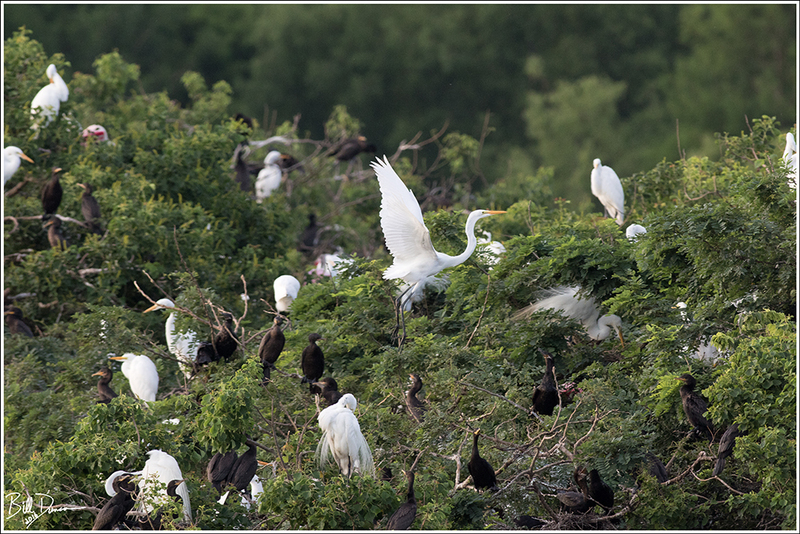 You can see more photos from the High Island rookery and the Texas Gulf Coast by visiting me on Flickr. 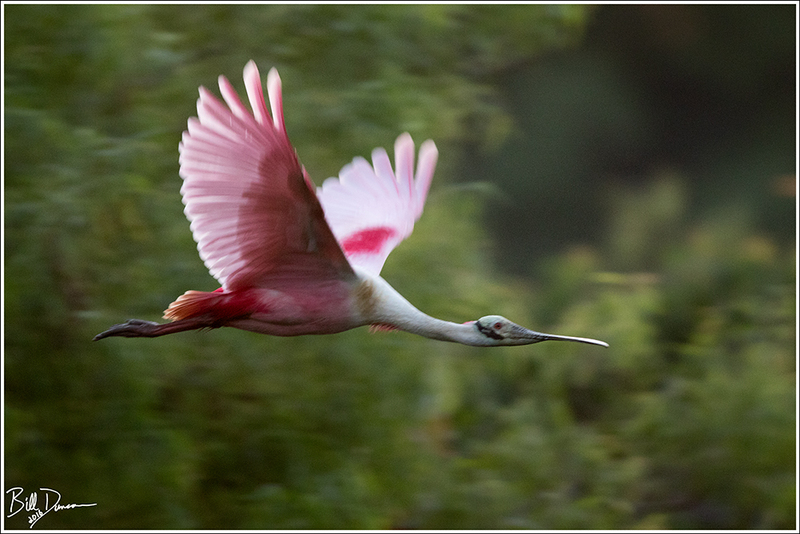 Nice photos, I like the Roseate Spoonbill.